Running out of gas is an embarrassing and potentially dangerous situation – and that’s why grandma always told us to never let the tank get below one-quarter full. It might seem like a smart idea to keep an extra can of gas in the car, but that’s exceptionally dangerous. Gasoline is exceptionally volatile and tends to emit dangerous fumes when it gets warm, not to mention the fact that it gets gummy and unusable when stored for long periods. 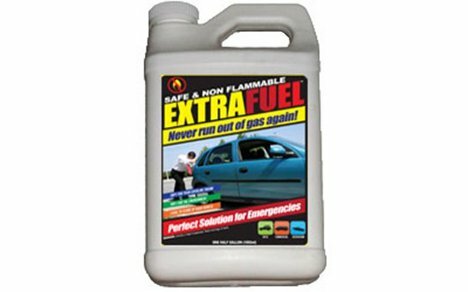 A product called Extra Fuel is being marketed as a safe alternative to keeping a can of gas in your car’s trunk. It is meant to get you only as far as the nearest gas station; at $19.99 for a half-gallon jug, it is definitely an emergency-only product. But when you’re stuck in the middle of nowhere with an empty gas tank, that $20 investment will seem pretty reasonable. 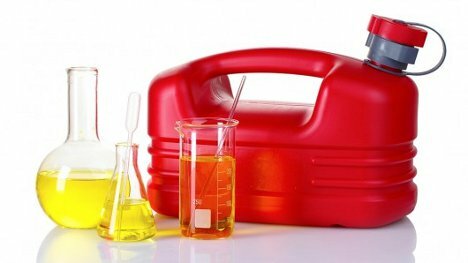 Extra Fuel works in any gasoline engine (not diesel), and it is formulated to be much safer than gas. It is basically gasoline without the volatile elements. It works by pushing residual gas through the fuel line – and according to the makers, there is always some residual gas even when the tank is empty – and using that tiny bit of gasoline to start the engine. The Extra Fuel then keeps the engine running long enough for you to get your vehicle to a filling station for some real gas.